MisuraEmme is one of the 15 companies that have consistently taken part in the most important international event in the world of design and furnishing since its fist edition in 1961 and preparations for the 57th edition of Salone del Mobile.Milano are in full swing to show the new table Gaudì signed by Ferruccio Laviani. The Brianza-based company renowned for its bespoke production proposes a unique and exclusive solution, able to meet the sophisticated taste of an increasingly heterogeneous clientele. The agile and linear structure of solid wood blends the noble exoticism of Sahara Noir, one of the most elegant marbles in the world. 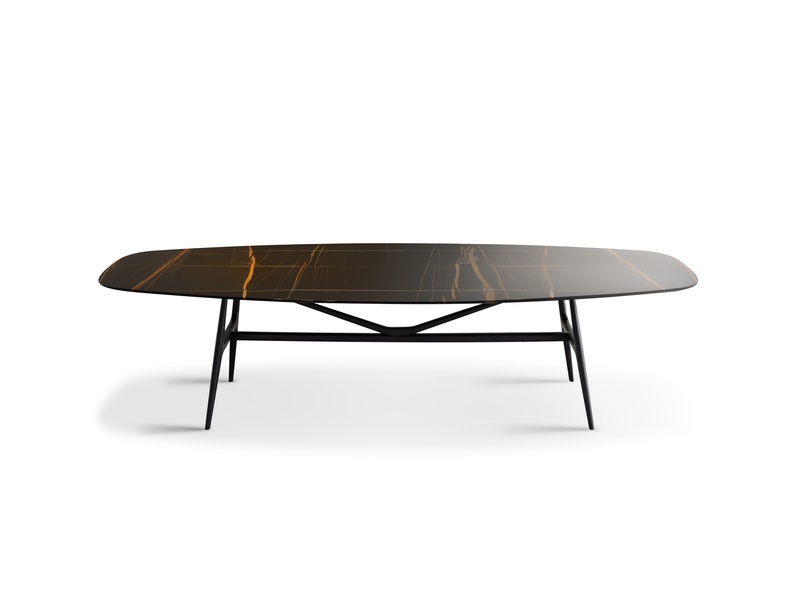 This is the new feature introduced by MisuraEmme, which reveals the many customization options designed for Gaudì table, thanks to a selection of high quality materials available for the semi-oval shaped design. Not just wooden tops, but excellent natural stones or tecnomarble, depending on individual furnishing requirements. The black background with white-gold veins of Sahara Noir creates a great effect, sublimating at the same time the articulation of light crossings that characterize the base. A slinky elegance for an authentic masterpiece by MisuraEmme.